Spring Fling Models is a picture, with genre photograph. Its dimensions are 3.5 in. x 4.4 in.. It was created in April 1974. Activity Club of Thomas Worthington High School is the Creator. 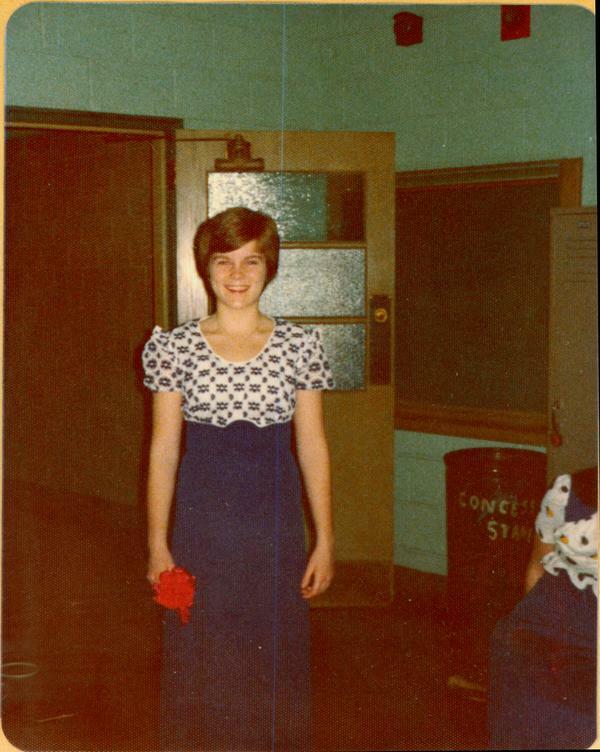 A Worthington High School students is pictured modeling fashions that would be featured in the 1974 "Spring Fling" pre-prom style show. The event, sponsored by the Activity Club featured a fashion show, stage band, vocal groups, thespian skit, and door prizes. 1974 models were Dean Blythe, Jeff Brown, Doug Burkhart, David Cavanaugh Jr., Aaron Combs, Mike Fluellen, Kevin Foley, Sylvia Harding, Sally Haywood, Jeff Knight, Linda Latimer, Lynne Livingston, Ross Long, Kay Morrison, Gayle Parkhill, Lisa Roby, Robin Rogers, Mary Scott, Tom Semans, Mark Stevens, John Strickland, Sheri Simcox, Barbara Warner, and Patt Whitehead. The Activity Club was founded in 1937 as the Personality Club by Mrs. Miriam Mackay, who saw a great need to form and organization dedicated to assisting youth with their social and personal problems. The club was originally formed with sponsorship by the Worthington P.T.A. Among the first activities of the group was the remodeling of formals for girls who were in need of them. Guidance concerning proper dress, manners and hostess etiquette were in demand. Although the club's focus was initially on girls, boys soon became interested and were also included in the programs. Over the years interests broadened, and the group was reorganized as the Activity Club. Social dancing classes for students from grade 4 to 12 became a major activity of the club during the 1940s and 1950s. Interest in dancing declined during the 1960s. Following a brief renewal of interest in dancing in the late 1970s, the emphasis on dance programs was discontinued. During the 1980s the purpose of the Activity Club broadened to fulfill changing needs. New projects were initiated, such as workshops on leadership skills, College Previews, College Fairs, and coordination of the Baccalaureate Service for graduating seniors. The Activity Club began sponsoring the Junior-Senior Prom "Afterhours" in 1986, and a "Cards Camp," a middle school drug, alcohol and tobacco prevention program in 1988. Following the opening of Worthington Kilbourne High School, the club split into two separate Activity Clubs, one for each school. It covers the topics school dances, clubs, students and fashion. It features the people Patt Whitehead, Dean Blythe, Jeff Brown, Doug Burkhart, David Cavanaugh, Jr., Aaron Combs, Mike Fluellen, Kevin Foley, Sylvia Harding, Sally Haywood, Jeff Knight, Linda Latimer, Lynne Livingston, Ross Long, Kay Morrison, Gayle Parkhill, Lisa Roby, Robin Rogers, Mary Scott, Tom Semans, Mark Stevens, John Strickland, Sheri Simcox and Barbara Warner. You can find the original at Activity Club of Thomas Worthington High School. The Worthington Memory identification code is twa0054_001. This metadata record was human prepared by Worthington Libraries on January 16, 2006. It was last updated October 20, 2017. Prom season is upon us! Take a stroll through this month's exhibit to view the finest fashions from decades past.